Italy is among the favourite countries of many travelers but it has never made into my list of favourite destinations. I definitely do not dispute the fact that Italy is beautiful.I however think that it is, in certain ways, a little too beautiful. If we compare similar regions, I will take Provence over Tuscany any day and Paris over Rome. It may be due to the fact that the French people never change their ways to accommodate the tourists. This at times make it a challenge to travel in France but also somehow a more honest experience. I however rarely get that feeling in Italy and pass to the less excited stage pretty quickly. The scenery in Tuscany is so beautiful but it is at the same time so twist-free that your eyes get used to it very quickly taking the element of surprise out of the picture. After this not so inspiring introduction about Italy, I will now confess that I have already been to Italy three times and one of my trips was during the famous Venice Carnival held annually in Venice each February. Here comes the second confession – that trip turned out to be one of the most amazing travel experiences of my life but it absolutely had nothing to do with the carnival itself. It however had everything to do with my forced imagination and the famous Thomas Mann novella Death in Venice. You may know the story; Death in Venice is about a German author going through a writers block and traveling to Venice where he develops some sort of obsession with a young boy; an obsession, which eventually leads him to his end. 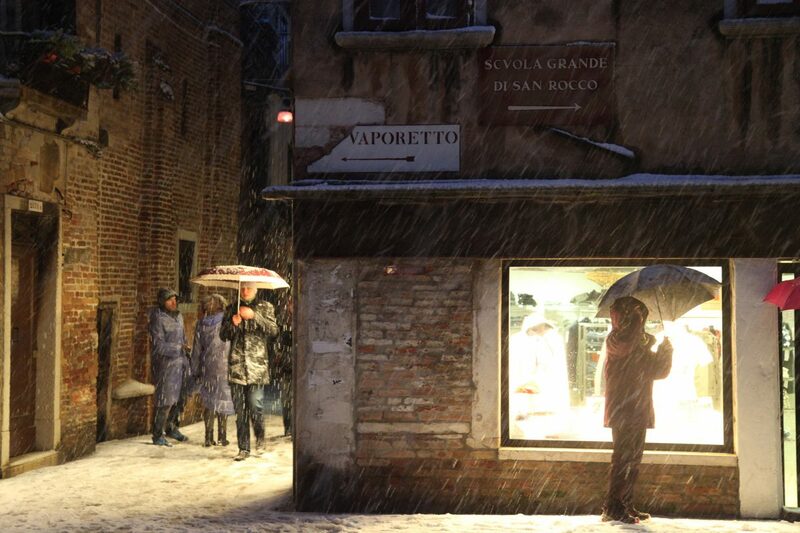 At the second day of my four days trip to Venice, a snowstorm hit the town while I was touring around. To be honest, up until that moment, I was not feeling all that excited about Venice and tried to understand what all the fuss was about. However, the snow gave me the chance to experience Venice not as an over-touristy place but as the most beautiful background that a snow scenery can benefit from. Imagine snow in a place where there are no cars, only operating vehicles are gondollas and nearly everyone managing to stay out are carrying beautiful umbrellas adding colour to the scenery. The instant decrease in the number of people out on the streets allowed those willing to stay outside to truly enjoy Venice architecture under a completely different and intriguing look. This is where my forced imagination and in my view – the most amazing author ever lived comes into the picture. Although the novella Death in Venice takes place in summer, the snow changed the entire atmosphere of Venice by overtaking the city and making it feeler closer to the atmosphere depicted in Death in Venice or at least allowing me to more easily imagine it that way by creating a quite timeless atmosphere. Once I got home, I re-watched Visconti`s Death in Venice just to compare the views I experienced and the scenes from that movie. Although the feeling of isolation caused by snow felt probably much dreamier than the one caused by cholera (the occurrence in Death in Venice making almost everyone desert the city), the effects of both were still similar to some degree as both events initially triggered panic leading to desertion. By the way, if you have not seen the movie, it is a great one and the soundtrack is even better. I tried to photograph the snowstorm as much as I could even though it was one of those days I was running out of memory space causing me to shoot only in JPEG and quickly judge and delete those photos not looking like a keeper right on the spot. In the meantime, if you have not read it yet, I think you should give a chance to Death in Venice. It takes time to sink in but once it does, it will stay with you for a long time.